One of the most terrifying nights of my life happened when I was in 5th grade. At least, I’m pretty sure it was 5th grade. I was at Elizabeth Berry’s birthday party havin’ a good ol’ time when someone decided it would be fun to watch a movie. Great idea, I thought. But then, I heard them say we were going to watch Children Of The Corn. I couldn’t believe my ears. Children Of The FREAKIN’ Corn????? Are you FREAKIN’ kidding me????? I was scared to death and the movie hadn’t even started. I was the youngest kid there, though, so there was no way in heck I was going to protest. It would have been social suicide at that stage in life. So there I sat, seized with fear, as some crazy corn kids chased people through corn fields and killed them. I had nightmares for years. 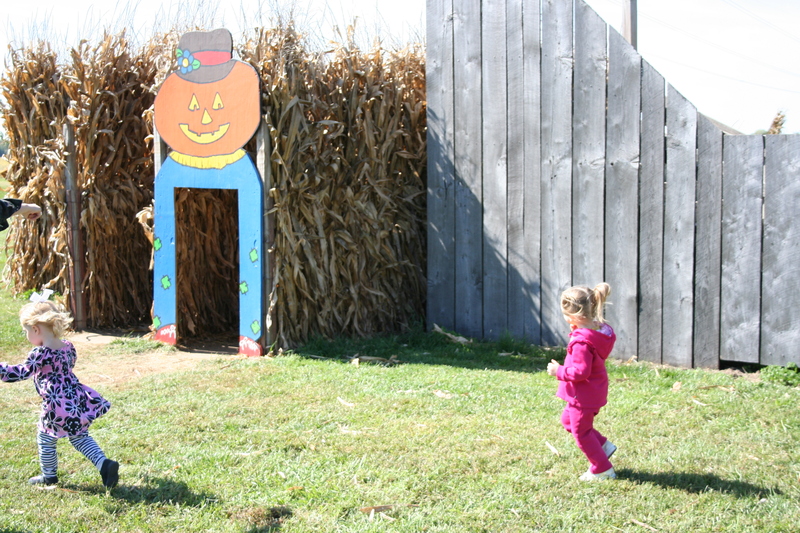 Last week, Arle and I were invited to join some other moms and their kiddos at a pumpkin patch. I can’t say for sure, but I’m pretty sure this was a first for me. I don’t recall ever having been at a real-deal pumpkin patch before. The place we went had all sorts of activities for kids. Arle was loving it and while she was running around checking it all out, I was running behind her with my camera trying to get some good shots. At first, it didn’t occur to me what I was seeing. It wasn’t until the third shot that I realized, HOLY COW! THAT’S A CORN MAZE! OH #*&%! I’ve heard about these stupid corn maze things and determined long ago that I would rather have my fingernails pulled out one by one than go in one of those things. I imagined huge mazes that might take hours to get through if you took one wrong turn. What if I got lost? What if there were crazies hiding in there? 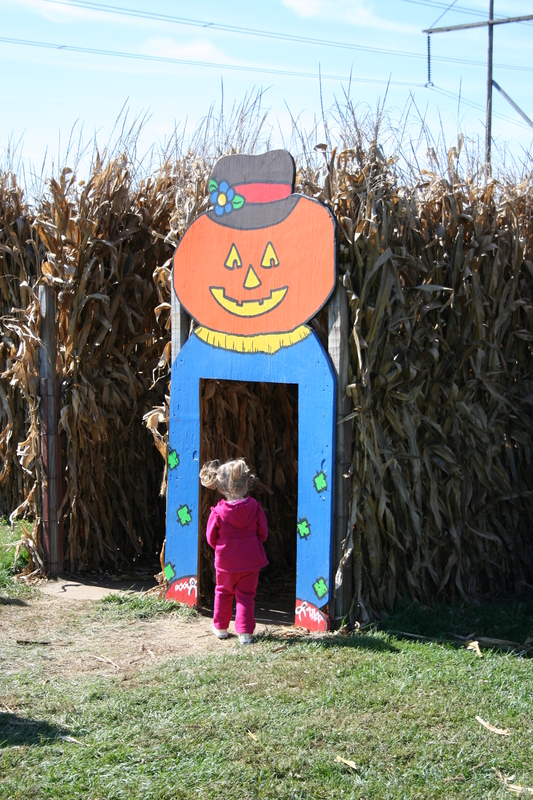 But suddenly, I found myself in a stand-off with a corn maze. And my two-year-old daughter was heading straight into the mouth of it. I yelled at her to stop, but it was too late. She was in and I had to go after her. She had a decent lead on me, too. I kept trying to catch up with her and she just kept turning corners going this way, that way and the other way. I kept wondering if there was any chance of ever finding our way out. But suddenly, there was light at the end of the corn maze. We made it out alive and well. I was on the verge of tears of joy and terror when I turned around to look at the labyrinth of corn stalks. I realized this maze wasn’t so much a maze as it was a track. There really wasn’t any way of getting lost, but still, it was a corn maze. And I never want to go in one again. i’m with Grammy on this one. can we please call halloween “sweet treats day”? that’s what it is over at the natos, as we don’t celebrate “halloween”. the word halloween just sounds scary anyway. That Arle is one brave, out going girl!! 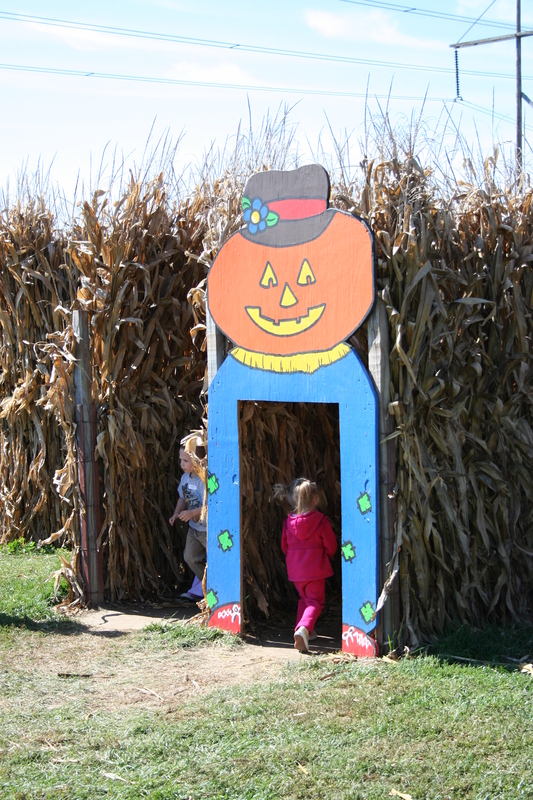 It did look like a fun place…minus the corn maze, hope you all still had fun! Just wanted to say I love honey crisp apples…and I don’t even really love apples. I was having my hair colored yesterday and my stylist had one and she offered me a slice and I loved it! Went straight to Walmart and bought some!! you wouldn’t be scared of them if you had my experience with children of the corn. got my first kiss whilst watching that horror film.